All place cards are crafted by hand using materials of the highest quality. This particular design features an elegantly tied satin ribbon, echoing the luxury of the Wish collection. Wedding place cards are made using beautiful 285gsm pearlescent card and luxurious satin ribbon and are available in all colour combinations. Guests' names are printed at no additional cost. 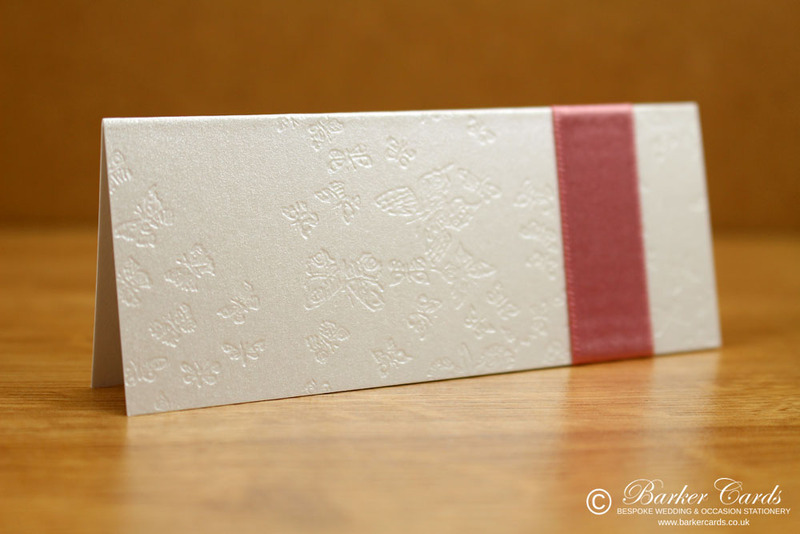 The example shown is made using Diamond Butterfly Embossed and Silver pearlescent card and Dusky Pink satin ribbon. We're also very happy to design place cards especially for you, if you would like something a little different to complete the unique style of your big day. and to order using product code PN016.